I’ve been going to Lakeland since I was a little girl and can honestly say it’s my favourite place to be. Not having many high hills in the New Forest and with a visit to my cousin late afternoon, we keep our first walk short and low starting out from the White Moss car park on the edge of Rydal Water, walking around the lake along the Loughrigg Terrace, visit Rydal Cave and return along the Coffin Road. 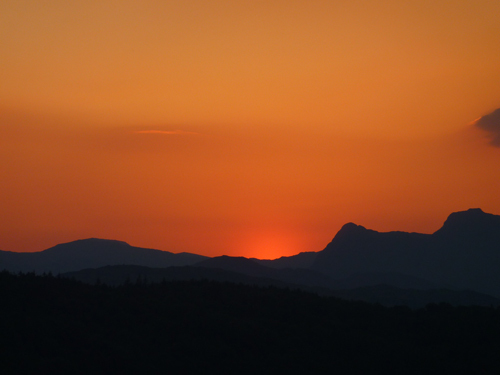 But first, just a couple of pictures taken from Rayrigg Car Park above Windermere of the sunset the evening we arrived – the 22nd. 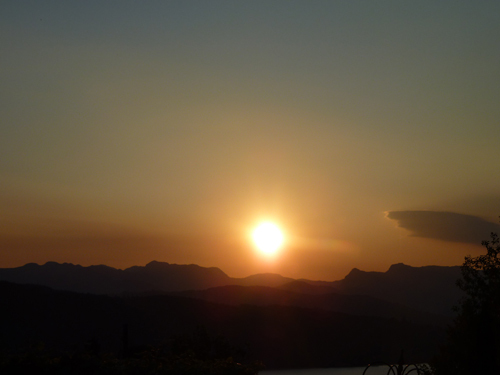 A beautiful sunset to start the holiday, looking at the classic view up Windermere to Crinkle Crags, Bowfell and the Langdales with the sunset bright behind. Zooming in on the view – amazing colour. 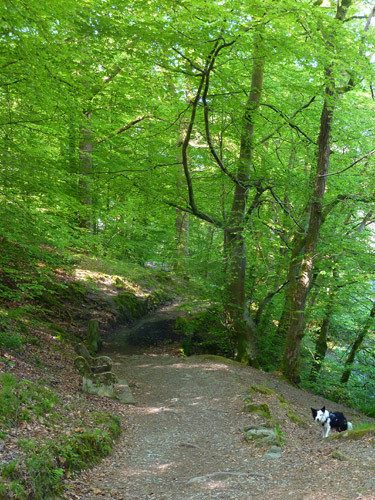 In the morning on the 23rd, I give Harry a quick walk up to Stockghyll Force, just 10 minutes walk from the cottage. 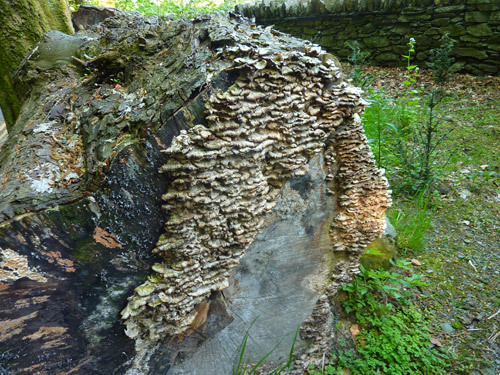 As I set out from the cottage, this fungi catches my eye on a log by the road. 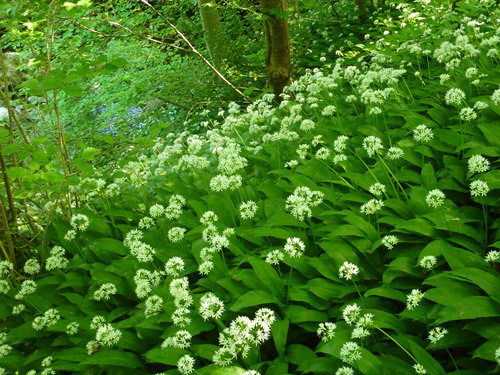 …and the white flowers against the green foliage look delightful and fresh. 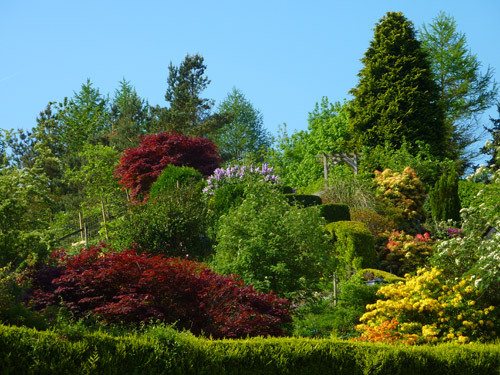 Across the road from the entrance to Stockghyll Wood is this gorgeous garden full of azaleas, rhodedendrons and acers. 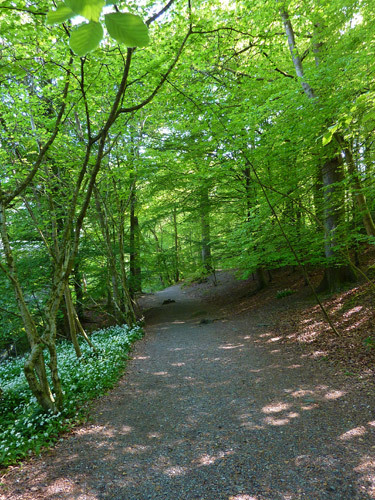 The entry way to Stockghyll Wood. 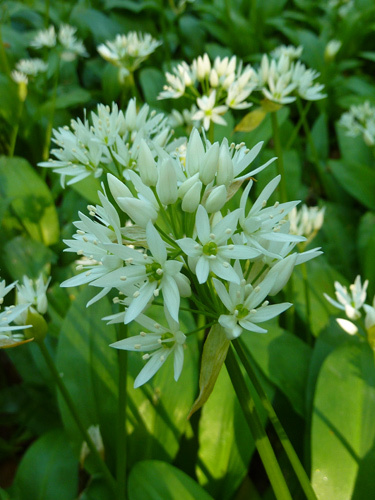 The wild garlic on the banks presents a lovely macro opportunity. Looking back down the path. 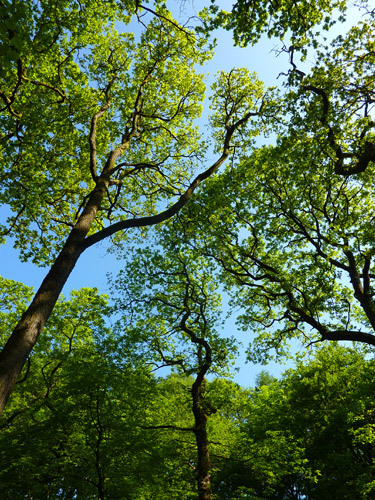 Looking up into the towering beech trees. 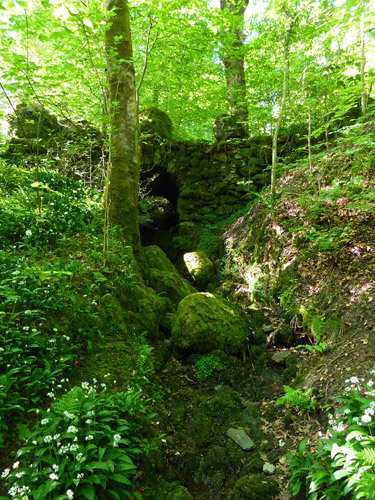 Before crossing the halfway bridge I pass below this stream which normally feeds into the ghyll. After such a dry spell, there isn’t a drop in amongst the moss. 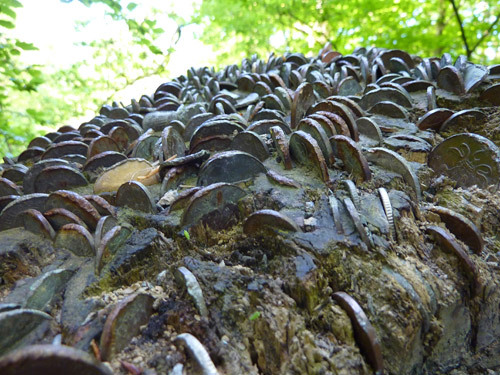 Nearing the the force now, at the side of the path is this old tree stump into which people have hammered two penny pieces. Or maybe money does grown on trees! Where is the pound tree, that’s what I’d like to know! 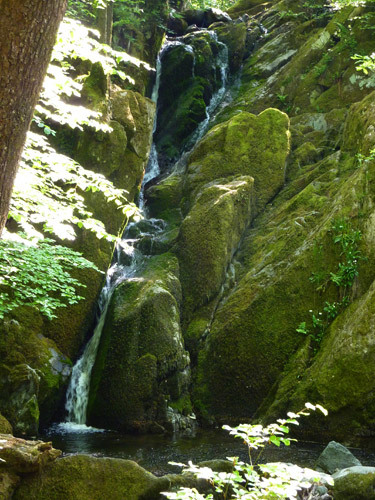 Stockghyll Force. More dribble than forceful this year! 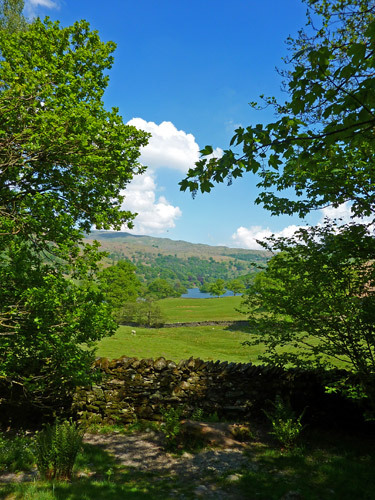 So, to Rydal. I was looking forward to visiting the famous Rannerdale bluebells later in the week, I wasn’t prepared for the bluebells to be so spectacular everywhere else. 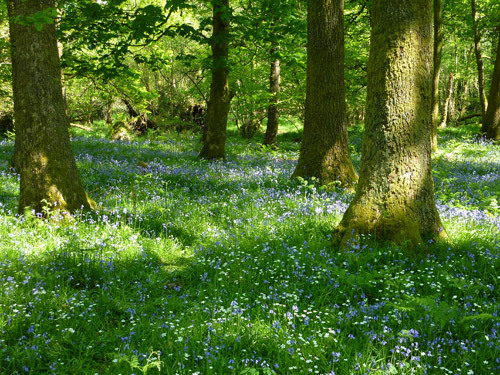 As soon as we enter the woods it becomes obvious that the bluebells will become a definate theme for the holiday. 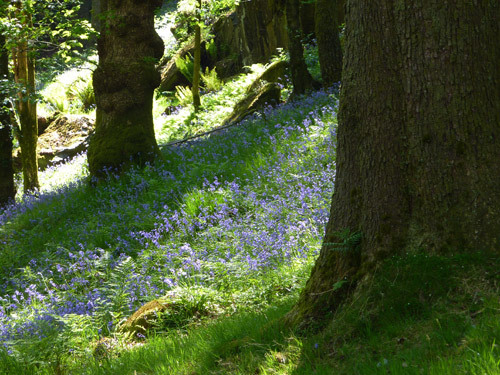 Bluebells, everywhere we look. 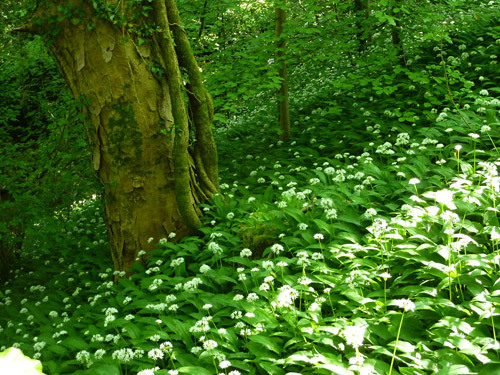 This reminds me of Pony Billy in the bluebell wood in Beatrix Potters Fairy Caravan. 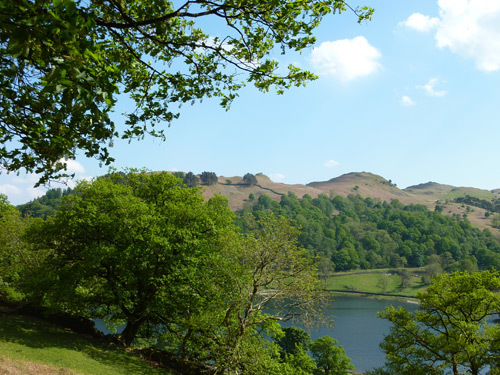 Rydal Water and the lower slopes of Nab Scar just before we pass through the gate to Loughrigg Terraces. 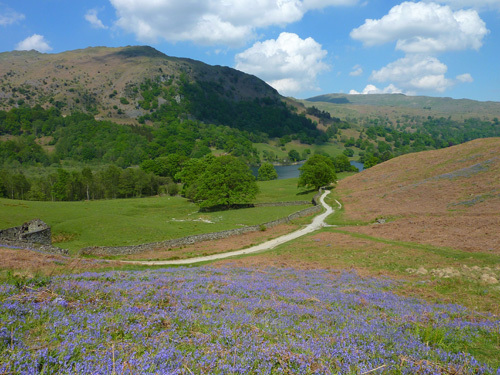 Once out onto the path under Loughrigg, the bluebells show that they’re not confined to the woodland. 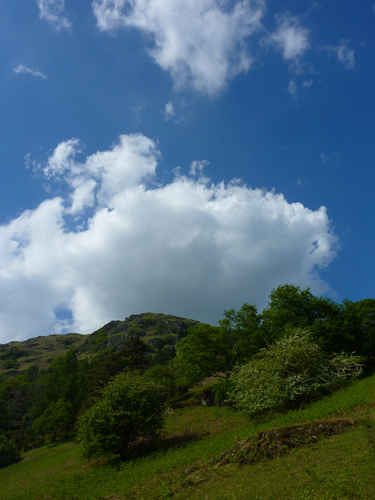 Nab Scar in some shadow creates a comfortable bulk above Rydal. 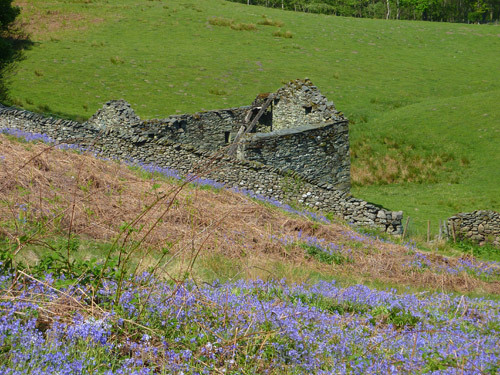 Over the bluebells, a ruined barn below us. Nab Scar – not just wonderful scenery and colours but a beautiful sky as well. 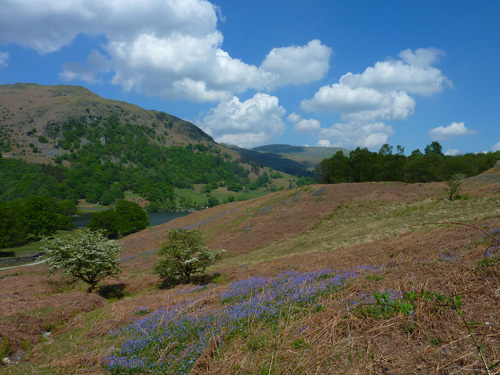 Looking back along the terrace to bluebells and the fells behind Grasmere. 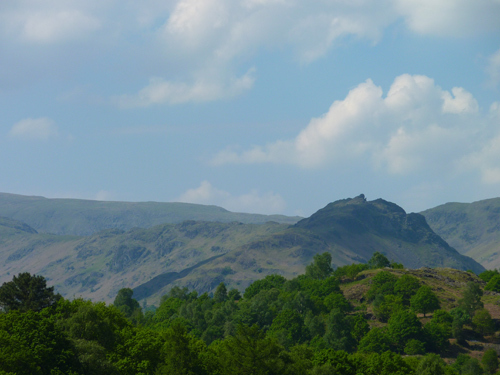 Zooming in on Helm Crag behind Grasmere. 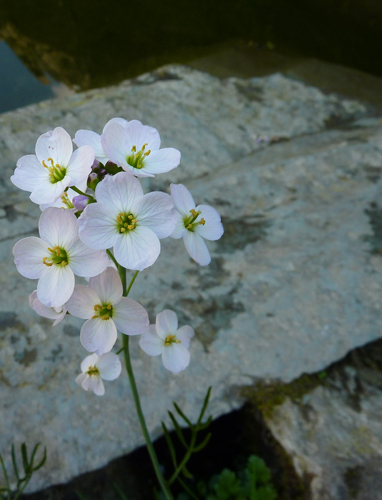 Lady’s Smock or Cuckoo Flowers (Cardamine Pratensis) growing at the edge of Rydal Cave. On the Coffin Road now, such a hot day, and looking up at Nab Scar above us. 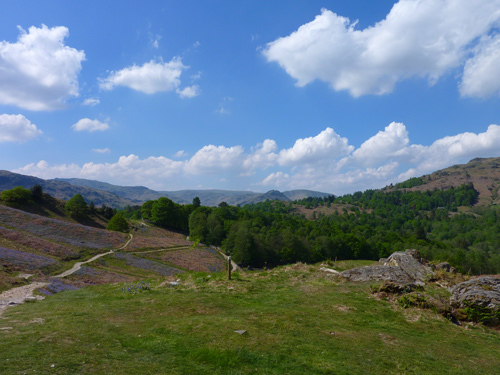 Loughrigg Fell from the Coffin Road. 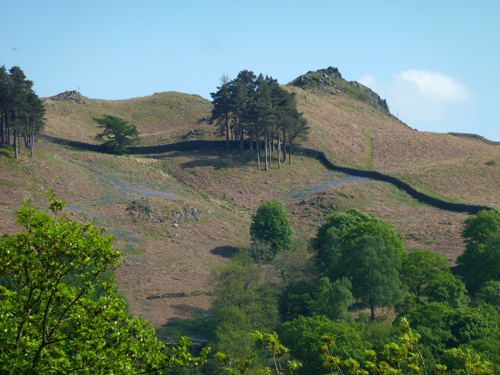 Zooming in on Loughrigg, bluebells again!. 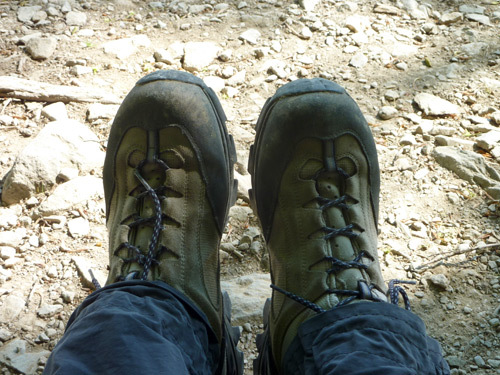 Taking a rest, the feet are still working! We spend the late afternoon and evening with my cousin and his wife who have moved to Windermere. The views from their house are just amazing as is the sunset we’re treated to! 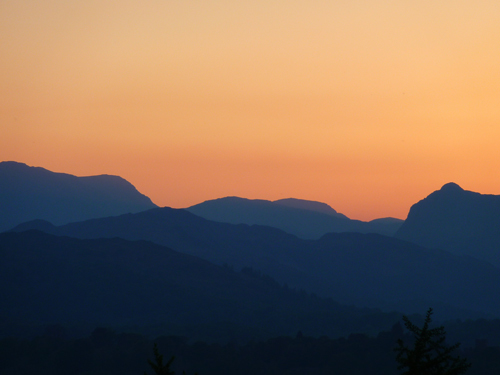 Zooming in on the sunset over the Langdale Pikes. What a great first day and thank you to Adam and Claire for a very fine roast beef dinner and their kind hospitality!